The Seward County softball team (21-13, 8-0) increased their win streak to six game on Wednesday, sweeping Garden City in their double header. 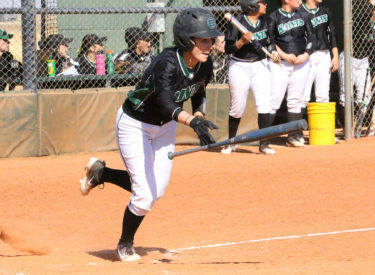 The Lady Saints won game one 8-0 from the mercy-rule before winning 7-2 in game two. Monique Ashley (15-3) had another stellar start in the circle in game one, pitching 6.0 innings and allowing just three hits in the shutout. She struck out 11 more batter in the process while walking just two. The Lady Saints finished with 12 hits in the game with Jullian Atteberry, Sage Harrison, Corrina Porras and Miranda Nester leading the way with two hits apiece. Eight Lady Saints ended the day with an RBI. After a scoreless first inning, Seward got on the board in the bottom of the second. Sydney Epp walked to lead off the inning before Porras doubled to left field to score Epp. Paige St. Pierre drove in Porras two batters later with a line drive up the middle to make it 2-0. Following a strikeout, Kaitlin Ammermann doubled to leftfield to score St. Pierre. Another double, this time by Leena Mortensen, scored the final run of the inning, bringing the game to 4-0. The scoring halted briefly in the third inning, but an Atteberry single to centerfield in the bottom of the fourth scored one more for the Lady Saints. She scored Miranda Nester, who reached on a leadoff single, but advanced to third base from an error by the right fielder. The Lady Saints got another across the plate in the bottom of the fifth. Harrison led off with a single to left field and was brought home by Nester who singled with a shallow fly ball to center field to make it 6-0. Needing just two runs to end the game from the mercy rule, the Lady Saints did just that. Harrison doubled to centerfield to score Atteberry, who reached on a leadoff double, to make it 7-0. Madeline Owen stepped up to the plate next and knocked in Harrison with a single to right field to end the game, 8-0. Jordan Cordrey (6-7) earned the start in game two, pitching a complete game. She went 7.0 innings, giving up two runs on three hits and striking out three batters. Seward came away with 11 hits with Mortensen (3), Atteberry (2) and Epp (2) each finishing with multiple hits. Ammermann led the Lady Saints with two RBI in the game. The Lady Saints got straight to business, as Mortensen scored in the bottom of the first with a line drive single to right field from Harrison to give the Lady Saints an immediate 1-0 lead. The Broncbusters tied the game in the top of the second. An error trying to catch a baserunner stealing third pushed the tying run across the plate. Seward quickly retook the lead in the bottom of the second. Epp reached on a leadoff single up the middle and came home from an error on St. Pierre’s fielder’s choice. St. Pierre advanced home with the next-at bat with Atteberry hitting a ground ball to third base, causing an error on the throw. Mortensen single two batters latter to score Atteberry, making it 4-1. After a scoreless third inning, Ammermann put two more on the board for the Lady Saints with a two-run dinger over the left field wall, scoring Atteberry who reached on a double. No runs came across in the fifth, but both teams came away with one run in the sixth. A leadoff double, followed by a sac fly by the Broncbusters put a runner on third base. She reached home with the next at-bat from a single to bring the game to 6-2. The Lady Saints pushed their lead back up to five with a leadoff solo home run to left field by Atteberry, making it 7-2. Cordrey retired the side in the top of the seventh to give the Lady Saints the victory. Seward will start a 10-game road stretch, starting at 2:00 p.m. on Sunday (March 25) with a match up in Great Bend against the Barton Cougars.